On 3 December 2018 a Soyuz spacecraft will take off on a mission to transport three astronauts to the International Space Station (ISS). The new crew will be ISS Expedition 58 and will stay at the station for six months and their arrival will allow the current ISS crew to return to Earth. Just over a month ago, many thought this launch would not take place because the previous mission Soyuz MS-10 had failed to get into orbit. Soyuz MS-10 launched at 8:40 am on 11 October 2018 from Baikonur Cosmodrome, Kazakhstan. After about two minutes of flight the spacecraft appeared to lose acceleration and started to fall back to Earth. Fortunately, the Soyuz’s systems detected the failure and the emergency escape system pulled the Soyuz capsule, with astronauts Nick Hague and Russian cosmonaut Aleksey Ovchinin onboard, away from the rocket. They landed safely, only 20 minutes after they had launched. ‘It is likely that Russia will have to delay many future launches as it demonstrates to the world that its rockets and facilities are safe enough to carry more astronauts. For comparison, the Space Shuttle was twice grounded for over two years: in 1986 after the Challenger disaster and again in 2003 after the Columbia disaster. If Soyuz had been grounded for a long time, the spacecraft docked to the ISS would have been used to transport its crew back to Earth. 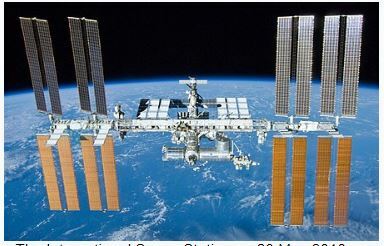 NASA would then have had the undesirable situation of the ISS being unmanned for the first time since Expedition 1 arrived in November 2000. 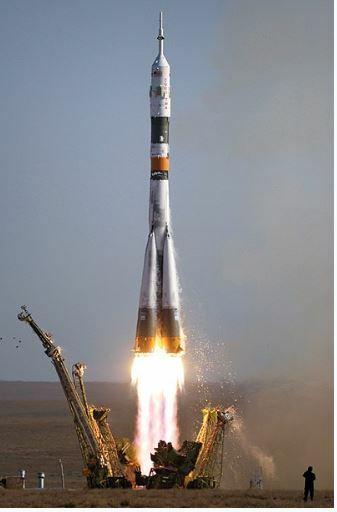 However, there was to be no long-term grounding of Soyuz. 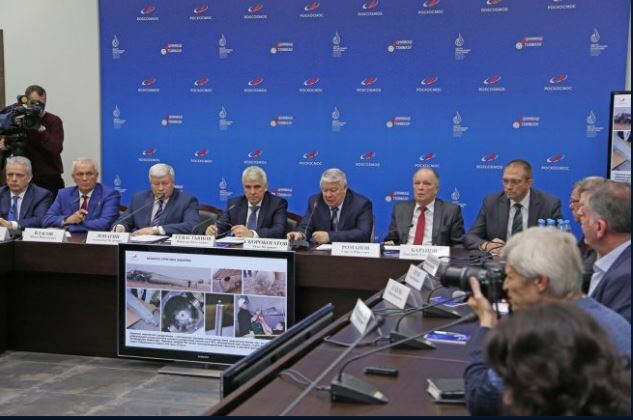 On 1 November, only 3 weeks after the failure, Roscosmos announced the findings of their investigation. The lead investigator told reporters that the launch ended up with a failure caused by abnormal separation of one of the strap-on boosters. that hit the core stage in the fuel tank area with its nose. This resulted in its decompression and, as a consequence, the space rocket lost its attitude control. To illustrate what had happened on 11 October the two diagrams below show a Soyuz Rocket at firstly at take-off and in then in an exploded view. The Soyuz launcher is composed of three stages. The first stage consists of four identical boosters, marked as A in the diagram above. These boosters are clustered around the second stage (marked as B). Each booster develops 174 000 pounds (774 000 newtons) thrust and fires for 118 seconds before its fuel is used up. (For comparison each of the four engines of a Boeing 747 develop 50,000 pounds thrust.) When their fuel is used up, a nozzle opens in each booster which allows gas to escape from its oxygen tank, the force of the escaping gas pushes the it away from the second stage. The booster falls back to Earth, breaking up in the atmosphere in the process. The second stage develops around 180 000 pounds (800 000 newtons) thrust and ignites at the same time as the first stage. Thus, the total thrust at lift off is 900 000 pounds (4 million newtons). Although this makes the Soyuz launcher a powerful rocket it is still quite small in comparison to the Saturn V, which took astronauts to the Moon and developed 7.6 million pounds (34 million newtons) thrust at lift off. The second stage burns for 290 seconds after which it separates from the rocket, falls back to Earth and breaks up in the atmosphere. The third stage, marked C, develops 66 000 pounds (294 000 newtons) thrust and is ignited after the second stage has separated. It burns for 240 seconds to give the spacecraft (marked D) enough velocity to get into orbit. So, what had happened was that on one of the boosters after its fuel was exhausted the nozzle had failed to open. It did not separate from the second stage and instead remained attached in an unstable manner. The tip of the booster punctured the fuel tank of the second stage causing its fuel to escape and the rocket became unstable and lost power. The announcement went on to say that the nozzle did not open because the the sensor pin that should have triggered this event was deformed. This fault occurred during the assembly of the boosters with the core stage in Baikonur Cosmodrome, Kazakhstan. The investigators did not reveal if they knew how the sensor was bent. He went on say the flight was moved forward to get the crew to the ISS as soon as possible since the last mission had failed. 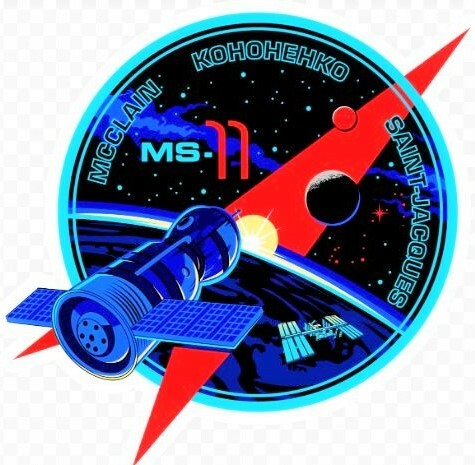 Interestingly, Soyuz MS-10 was viewed within NASA as a ‘successful failed launch’ since the crew had returned to Earth unharmed. Hopefully, the unfortunately event on 11 October will prove to be a one off manufacturing error and Soyuz will launch successfully on 3 December. Very true! But I think that NASA must have been under intense pressure to accept the Russian explanation, since the alternative of leaving the International Space Station unmanned was so undesirable. Fingers crossed for the launch! Yes it is still on schedule for tomorrow !